This product will add 0.57€ to your cashback account. 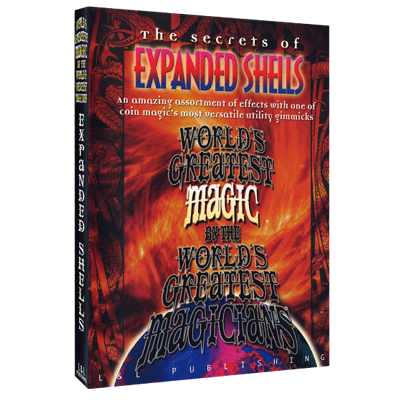 The expanded shell coin is one of the close-up magician's greatest utility gimmicks but unfortunately, many magicians have never really explored the full potential of this precision-machined and very powerful item. On this volume, you'll see some of magic's most original performers demonstrate the amazing variety of ways that this single tool can be used to create completely different and magical effects. Using the expanded shell, you'll be able to cause coins to invisibly travel, as ably demonstrated by David Roth, Michael Ammar, Mark Leveridge and Jon Allen or even make imaginary coins move like Garrett Thomas. You'll also be able to make coins penetrate straight through solid object, as performed and taught by David Roth, or even penetrate through other coins like Dan Harlan. Combine all of that with some completely different ideas from Harry Allen and the versatile Mr. Roth and you'll never look at expanded shell coins quite the same way again. Believe us when we say that there is a world of magic in a simple expanded shell coin and these world-class performers are your perfect tour guides.